• In this post, MIT undergraduate Cydnie Trice introduces a four-part series on the challenges of building a local economy in Hawai’i. Trice is a marketing intern for the Hawai’i Alliance for a Local Economy this summer. First, lets start with a short geography lesson. The state of Hawaii is made up of four major Islands: Oahu, Kauai, Maui, and Hawai’i. The largest of these islands is Hawai’i, which is often referred to as the Big Island of the state. Here is where my summer adventure takes place. The Big Island, while the largest in landmass, has the smallest population density and the strongest display of pride in the culture and history that lives through its residents. This diverse population thrives on family values and community driven efforts, but the Hawai’i County economy is not as interdependent as one may assume. Like many other U.S. counties, Hawai’i has developed a number of the mainstream comforts we have grown accustomed to in the states. Large fast food and grocery store chains are slowly rooting themselves in the hearts of the towns around the island. There is a Starbucks, Wal-Mart and Safeway grocery store in every major city around the island now. In some towns, it wouldn’t be hard to find more than one of these franchises. These large chain establishments are always busy, and well-stocked with supplies from the mainland. The only problem is, the entrepreneurs, small businesses, and locally owned companies on the island suffer. Each fight to gain patronage, resources, and support from those they are here to service: the residents of Hawai’i Island. With this in mind, several community leaders from around the Big Island have gathered to begin a “Think Local First” Campaign for their county. Appropriately naming the campaign HALE (Hawai’i Alliance for a Local Economy), which means house or home in Hawaiian, they are working under the model of the national umbrella of BALLE (Business Alliance for Local Living Economies). This new committee is dedicated to making this campaign a successful and sustainable endeavor. 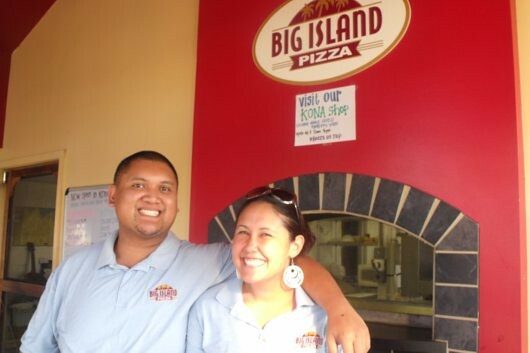 The crew at Big Island Pizza in Hilo, Hawaii. The committee has just recently kicked of their journey by gathering opinions, insights, and voices from the community. The next few weeks will be focused on gathering and interpreting this data. The next steps will be to promote the campaign and get local businesses and consumers on board to boost the economy on the island and take this campaign to the next level. My assignment for the summer is to assist with the marketing plan for the campaign. My tasks include helping with data collection and analysis, imaging and messaging, and evaluation of the campaigns success. The challenge the HALE committee is faced with is one that hundreds of counties around the US struggle with too. Hopefully, this “Think Local First” idea will spread and we can truly say we all support things “Made in America”. Post and photo by Cydnie Trice. This project is supported by the MIT Public Service Center. Great to hear your first thoughts on the project, Cydnie!